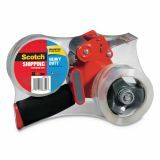 Scotch Packaging Tape Dispenser with Two Rolls of Tape, 1.88" x 54.6yds - Value Pack features two rolls of Super Strength Clear Packaging Tape and a handheld pistol grip dispenser. 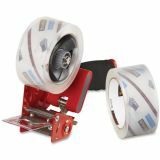 Ideal for mailing, moving, heavy-duty packing and shipping. Hot melt adhesive offers superior clarity. 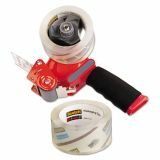 Tape resists seam splitting, slivering and tearing and meets U.S. Postal regulations for standard packages. Soft touch, pistol grip dispenser features retractable blade and built-in braking device.